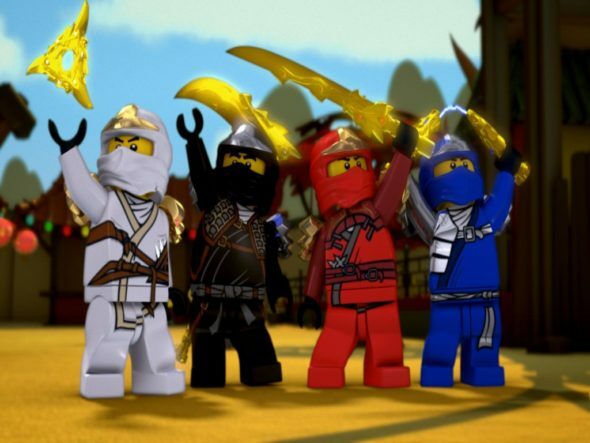 A spin-off movie of the LEGO Ninjago television show, the new LEGO movie once again centers on the relationship of a dude and his boy. Like the first LEGO Movie, the main story is nestled within the frame of events happening in the human world. A live-action sequence starts Ninjago when a young boy wanders into a Gremlins-esque antiques shop run by Mr. Liu (Jackie Chan). The lad seems a bit lost, possibly bullied, so Mr. Liu lets him hang out and spins a yarn about another troubled boy. Chan’s story comes to life, portrayed by LEGO minifigures, set in the island city of Ninjago. In the animated story within a story, we are introduced to Lloyd (voiced by Dave Franco), the abandoned son of Lord Garmadon (Justin Theroux), a warlord intent on destroying Ninjago. Everyone knows who Lloyd’s dad is and they direct their anger and frustration on the son. Thankfully, Lloyd does have some friends who happen to be part-time ninjas…just like him, who fight Lord Garmadon in supercool mechs. Like LEGO Batman, Ninjago is more than willing to take elements of other intellectual properties and play around with them. However, where Batman came off gloriously snarky and peppered with pop culture references, having creatures like Doctor Who’s Daleks’ interact directly with baddies like Lord Voldemort, Ninjago feels like the scriptwriters put their favorite fiction in a blender and hit pulse—Star Wars, Godzilla, Power Rangers, Austin Powers, Captain Planet, Voltron, Team America World Police with a little bit of Sharknado thrown in there, too. The action is pretty run of the mill, sacrificing the opportunity for what could have been some truly great physics-defying fight sequences for mech vs mech battles that seem like commercials for (admittedly probably pretty cool) playsets. The hero’s quest that forces father and son together comes off as somehow both rushed and ponderously slow. And the father/son drama so heavy-handed that you can almost hear Cats in the Cradle playing behind a particularly fraught conversation. LEGO Ninjago is the weakest offering in Lego’s growing collection of colorful family drama action movies, just serving to remind me that I should probably rent one of the previous two and have a night in instead.